Why Might I Need Your Personal Statement for Pathology Help? Many students fail to realize just how important having a good personal statement for pathology really is and so quickly produce a poorly written one at the last minute which is included within all their applications. Writing a residency personal statement should be written in such a way as to make you stand out from the many other applicants that an educational institution’s admissions review board will have to sort through. 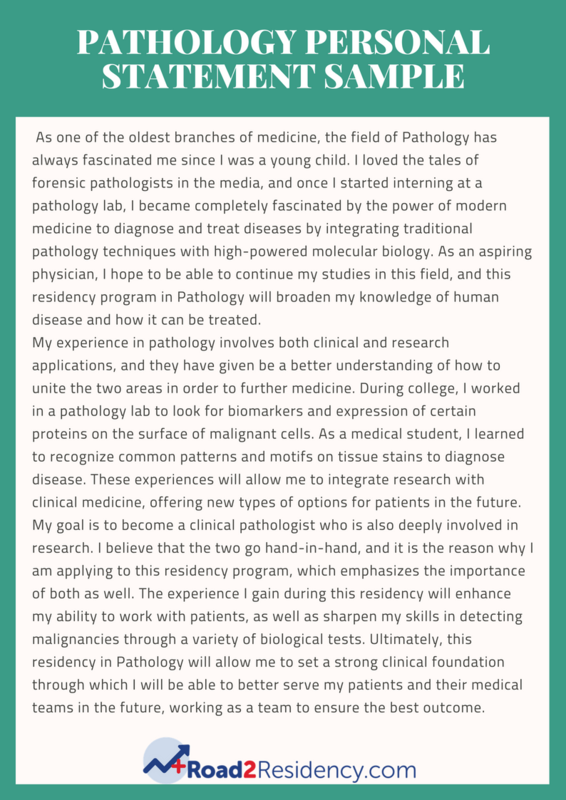 A statement of purpose for applying to the pathology fellowship should be individualized to the institution you are applying to have taken the necessary time carrying out research on them so you can specify what makes that particular college’s medical specialty is more appealing to you and how you are a much better candidate for them. During the 2016 enrollment period, there were 52 applications for pathology advancement learning through PhD programs at The University of Michigan with only 10 people actually getting a place. These figures highlight how fiercely competitive this career field is and why having a statement of purpose for applying to the pathology fellowship program is so vital to get right. You will need to include descriptive and detailed information to successfully promote who you are and what you have to offer in your own words. 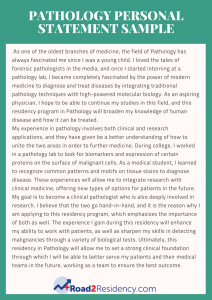 To show an admissions review board that you have a desire to excel in gaining a professional degree in pathology that will stay with you long after completing the program. Writing at this level is difficult for many to achieve and so they seek out professional pathology personal statement help from services such as ours. Our experts can help by significantly improving your knowledge of writing through correction of existing work and offering feedback and critique, taking your skills to the next level. Any type of writing can be difficult to those who are not suited to it, but having a high-quality personal statement for pathology is essential in order to get that desired place. We will supply you with a professional writer who has many years of experience in assisting many students with their pathology and internal medicine residency personal statement. They will get in direct communication with you to ensure they have all the necessary information needed in order to offer the best advice and then will carry out a review which highlights any errors. When finished, a copy will be sent to you where you will be able to learn from the corrections and add any feedback you think is necessary to improve the work further. When all the reviews are complete and you are happy with the content, final checks will be carried out to ensure that there are no errors through thorough proofreading and plagiarism tested to make sure that it is also completely original. “Students often agonize over what to write, but in the end, the most effective personal statement is a well-written and grammatically correct statement which highlights your strengths. It should reflect your career goals and reflect your personality and style. It doesn’t have to be unique or fancy, just an honest statement”. For the most reliable personal statement for pathology writing service to present you with truly individual help, get in touch with us for dedicated support which you can trust and afford!